Well, I guess I’m officially reactivated now. My first comic con table in a LONG time and while I’m exhausted I really did have a fantastic time. 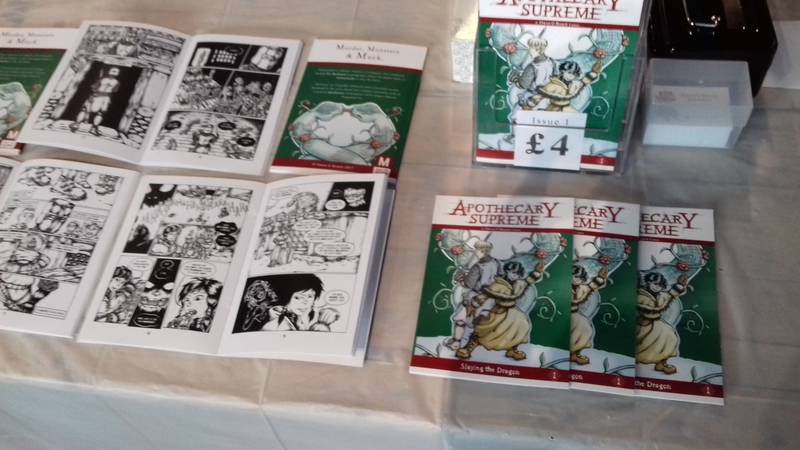 Besides flogging a fair few copies of Apothecary Supreme Issue 1, I talked with a whole bunch of awesome people who had lots of great feedback for me. I’m more motivated than ever now to really hit it out of the park with issue 2! I promise it shall be even more mucky, monstery and weird than its predecessor. That said I really am knackered courtesy of an extensive journey home and my impending return to the day job so I’ll save my in-depth thoughts for another post. Work on Issue 2 is very much ago-go and I’ll no doubt post up some of the less spoilerific pre-production stuff soon. My deepest gratitude to everyone who stopped by my table, bought a copy or just had something interesting to say. You all made my day, thank you! This entry was posted on Monday, July 31st, 2017 at 2:12 AM and is filed under Miscellaneous. You can follow any responses to this entry through the RSS 2.0 feed. You can leave a response, or trackback from your own site.